Built 1884 as a casino by H. Westra. Since 1901 used as a theatre. Named "Theater van Houtkamp". In 1918, renamed "Cabaret-Theater Scala". Ca. 1400 seats. Closed after a last performance on 7 Feb 1956. Subsequently demolished in favour of a parking lot. 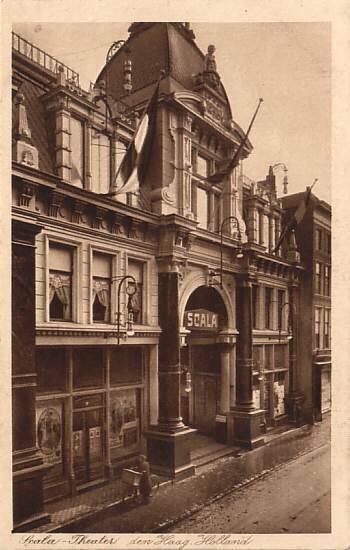 Front Text: "Scala-Theater, den Haag, Holland", sign: "Scala"